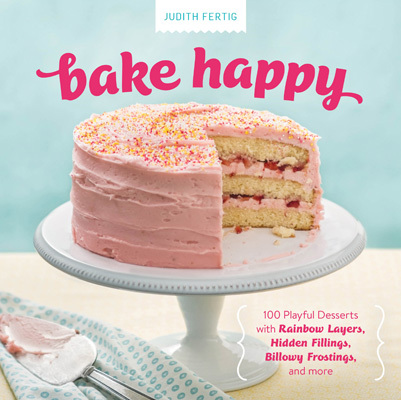 Judith Fertig knows her way around the kitchen and her new book, Bake Happy, has her hanging out with us near the sugar and flour bins. 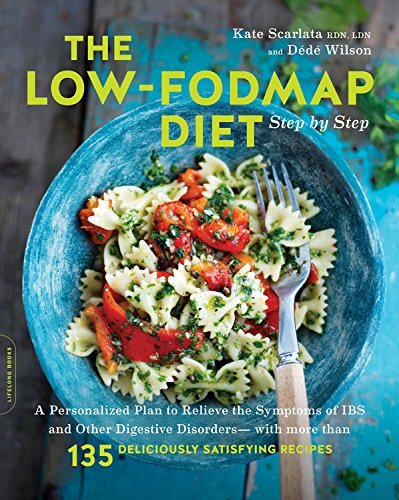 (Don’t miss her books that focus on more savory topics, like her Championship BBQ Secrets for Real Smoked Food and The Gardener & the Grill). 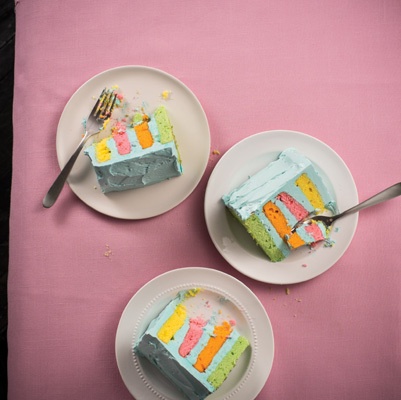 This Rainbow Cake can be tinted any way you like but we are quite partial to her robin’s egg blue buttercream. You could use the Greek yogurt for the cake batter, but we prefer the full fat of the sour cream. I mean, this cake just says, “We’re going all out!” Speaking of great looking cakes, check out her Seersucker Lemon Blueberry Cake Roll, also from her book. Reprinted with permission from Bake Happy © 2015 by Judith Fertig, Running Press, a member of the Perseus Books Group. Photo credit: Steve Legato. There’s something about a rainbow cake that just makes you smile. A rainbow cake can be vivid or more pastel, which I prefer. 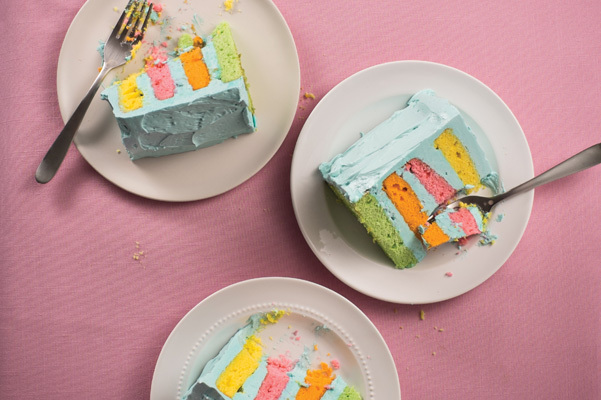 Cake flour and sour cream in the batter ensure that your cake will be moist and tender, yet firm and sturdy—just what you want for a rainbow cake. If you like, you could stir about 1/2 teaspoon flavoring into each tinted batter—lemon zest for yellow, orange zest for orange, lime zest for green, and so on. This makes a festive birthday cake for any age. Preheat the oven to 350°F (180°C). Butter four 8-inch (20-cm) round cake pans and set them aside. In the bowl of an electric mixer on low speed, cream together the butter and granulated sugar for 5 to 7 minutes until light and fluffy. Beat in the eggs, sour cream, and vanilla. Then beat in the flour, baking powder, and salt for 1 minute, scraping down the sides of the bowl. Set out four small bowls. Spoon ¾ to 1 cup (about 453 grams) of the batter into each bowl and tint each with food coloring to your desired color, such as pale yellow, green, coral, and pink. Keep in mind that the color will somewhat darken and brown during baking. Spoon a bowl of tinted cake batter into each of the prepared pans and smooth the tops with a spatula or knife. Bake for 25 to 28 minutes or until the cake comes away from the sides of the pan and is springy to the touch in the center. Remove the cakes from the oven and let them cool in the pan for 15 minutes, then invert them onto cooling racks to cool completely, about 30 minutes. To assemble the cake, save the most domed layer for the top. Place the flattest layer on a serving plate and spread the top with ½ cup (125 ml) of the frosting. Place another layer on top and frost the top of that layer with another ½ cup (125 ml) of frosting. Place the third layer on top and frost it with another ½ cup (125 ml) of frosting. Place the last layer on top of the stack. Using an offset spatula, frost the sides of the cake with half of the remaining frosting, then use the rest for the top of the cake. Slice and serve. 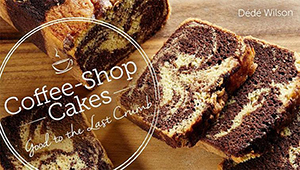 Store the cake, covered, at room temperature for up to 3 days.